Carcharodontosaurus saharicus is the largest meat-eating dinosaur known to have ever lived on the Earth (along with Giganotosaurus - now believed to be the same creature). Before its discovery, Tyrannosaurus rex was thought to be the largest but this monster exceeds T. rex in size and really is the "king"! Carcharodontosaurus had a massive tail, stout body mass, and heavy bones. Its arms were short and its hands had three fingers with sharp claws. Carcharodontosaurus grew up to 45 feet long, had a skull that measured 5.2 feet in length and is estimated to have weighed eight tons. It had large, powerful jaws with long, serrated, sharp teeth up to 8 inches long. Carcharodontosaurus was larger than T. rex but its brain was smaller. Recent studies indicate it might have been about the size of Allosaurus. Carcharodontosaurus is so closely related to Giganotosaurus (not to T. rex) that research now is leaning towards declaring the two creatures the same dinosaur genus. 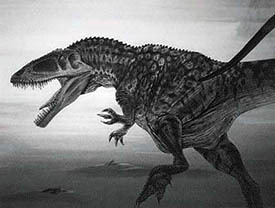 In 1925, Carcharodontosaurus fossils were first found by Charles Depéret and J. Savornin in Algeria. The remains consisted of a partial skull, teeth, cervical and caudal vertebrae, a manus ungual, an ilium, a pubis, a femur, and a fibula. The femur measured 1.26 meters. The original name was Megalosaurus saharicus but was later renamed by German paleontologist Ernst Stromer to Carcharodontosaurus. Further fossils were later discovered and collected from Morocco and Niger. During World War II, the holotype fossils of this dinosaur were being studied in Germany but were destroyed by Allied bombing. Based on studies of older and recent remains, scientists believe the genus Carcharodontosaurus includes some of the longest and heaviest known carnivorous dinosaurs that ever lived on land. Special Note: Unscrupulous fossil dealers, in an effort to make a sale by "enhancing" their sales, will call their Carcharodontosaurus fossils as from the "African T. rex" but there is absolutely no relation between the two dinosaurs. Carcharodontosaurus lived BEFORE T. rex and is not considered an ancestor or in the same lineage as Tyrannosaurus rex. There is no such dinosaur as an "African T. rex". Real Tyrannosaurus rex fossils are only found in North America and are valued many times the price of Carcharodontosaurus fossils.